The team at Timbeter have been catching up with several market leaders within the timber industry who have switched to using Timbeter to measure logs and timber. CEO Vallo Visnapuu spoke to Guy Waters from Aushang about how Timbeter has benefited his business. You’re from Aushang. What does the company do? Aushang exports sawn plantation pine timber (both green sawn and kiln dried) from Australia and New Zealand. Our clients are mainly located in China and Taiwan. Every month we export up to 40-100 containers of timber with annual turnover of 10 million AUD. My role is operations and sourcing timber in the form log for export to china market, this is a new expansion and diversification of our export operations. Essentially we use Timbeter as a vital tool for managing our log export operations. I have worked in timber industry whole my life. I was raised in the biggest radiata zone of the Australian Green Triangle. Domestically falling returns for plantation owners in Australia combined with sawmills having to handle rising costs and falling market volume. China sawmills have steady demand and falling domestic supplies. Typically, before using Timbeter how did you measure logs? On every log you need to print barcode (TimberMac). When working on muddy log yards this simply does not work, particularly on small diameter logs. Timbeter is a low cost and effective method to reduce the conflict between the weight of the log and the cubic meter volume of solid wood for when the export logs move to be sold. You’ve been using Timbeter now for 3.5 months. What are your first impressions of the app? It is a great app and has professional “hands on support” by experienced professionals who know the industry and technology. I have always supported new technology. I can send the pictures and detailed stock reports to my clients. It is simple and easy to implement. Especially by introducing young people to the industry which otherwise would not have had the opportunity. We need to record pieces (logs) cbm and tons, this needs to be supported by weighbridge dockets. Also having a record of the visual image of the logs measured. Lastly the weighbridge dockets need to be synchronized with timbeter data. It increases transparency, hence effectively reduces cost. When the costs for sawmill owners has increased, this aids us in reducing overheads and remaining competitive are required within the industry. By being able to send pictures to my clients they can see exactly what is being sent and check the timber upon receipt. What I particularly like is that with Timbeter I am able to work remotely – I can operate my log yard from the other side of the country. It is still early days with our clients however they support us to get the cost savings and efficiencies required. I am not sure short term, believing is using, using is trading. I have no doubt that in the long term it will take over the entire industry. The area of greatest need I believe is the is for the management of small diameter logs. 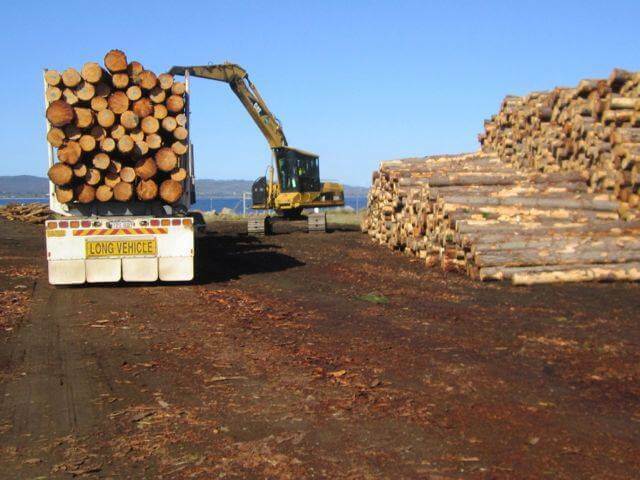 Our maximum intake in pine logs for export is currently 1500 tons, 2500 tons per day. At present one person manages this. Don’t delay and get involved, it will soon become as essential as a notebook and a tape measure within our industry.Even if you are using another system, use this system as a safety net or just to check as an auditing tool.